I was in Christchurch for a few days last week and inevitably came home with a pile of book purchases that are now sitting here waiting to be read and reviewed on the blog. I also came across a wonderful calendar featuring artwork from favourite NZ children’s books from illustrators such as Lynley Dodd, Gavin Bishop, Peter Gossage, Pamela Allen, Robyn Belton, Fraser Williamson and David Elliot. Published by Te Tai Tamariki – Aotearoa New Zealand Children’s Literature Charitable Trust (what a mouthful!) with a retail price of $25 this is a real gem. The illustration is actually the back cover showing the art for each month. I will also add three individual pieces below. Te Tai Tamariki – meaning the tide of children – is a registered charitable trust, founded in May 2006. The Trust has been set up to preserve and promote New Zealand’s children’s literature. Our country has produced many world-renowned authors, artists and illustrators over the decades, and more recently has shown leadership in the use of new technologies and media to communicate story. It is the original manuscripts, illustrations and other media of these New Zealanders that we want to protect and promote for the future. The Trust will continue to both promote and collect children’s literature (broadly defined), in a variety of media from books to digital forms. At present, there is no central body focusing on the collection, restoration, preservation and exhibition of such material, and it is feared that it will be lost if action is not taken. Te Tai Tamariki’s vision is to create a national centre – with its base in Christchurch – that will encourage a wide range of groups to enjoy and celebrate New Zealand’s children’s literature. The physical centre will be multi-faceted, with a wide variety of purposes including entertainment, education, research and retail. Such centres have already been established overseas as both domestic and international tourist attractions as well as educational centres. While still in its early days, the vision of Te Tai Tamariki is fast gaining the support of both the literary world and the general public. Bookman Beattie wishes them every success in their fine endeavours. Now back to the calendar. I found my copy in the wonderful Children’s Bookshop at 87 Victoria Street in Christchurch where there was much excitement at the visit the next day of leading Aussie children’s writer Emily Rodda in New Zealand to promote her latest book, The Key to Rondo, (Scholastic $30). 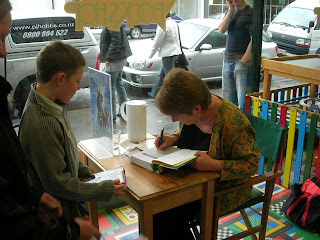 Picture right shows Emily Rodda signing her new book for a young fan. She was greeted by long lines of children and adults and the Children's Bookshop reported that her visit was a huge success. Bookman Beattie is not surprised, she is a hugely talented, charming and agreeable person. Gavin Bishop illustration from calendar (left). The calendar is available at good bookshops everywhere or in case of difficulty the Children's Bookshop in Christchurch or at their Auckland store in Jervois Rd., Ponsonby.